Yayy, I’ve made something that isn’t jeans! I’ve hardly made any dresses so far this year which is unusual for me, so decided to get back into it by using up a pretty stash fabric and trying a new pattern, the Papercut Sigma. 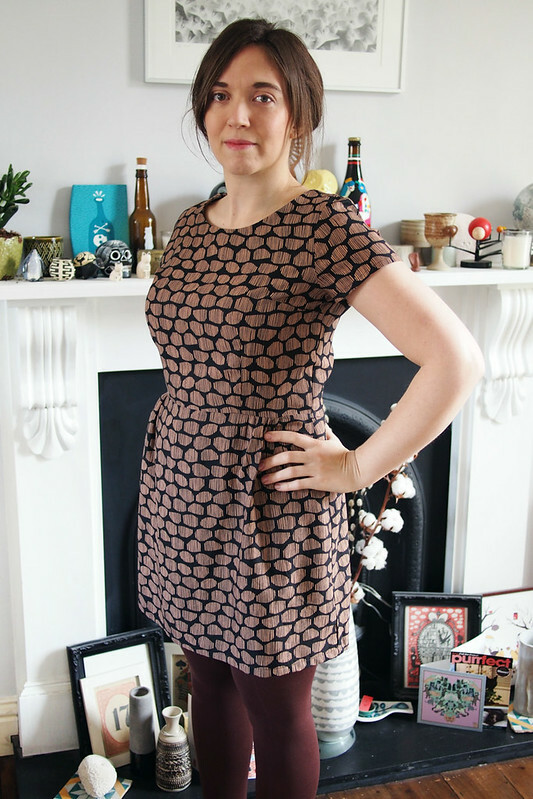 I bought the pattern on a whim from Ray Stitch – a bit of an expensive whim at £15. 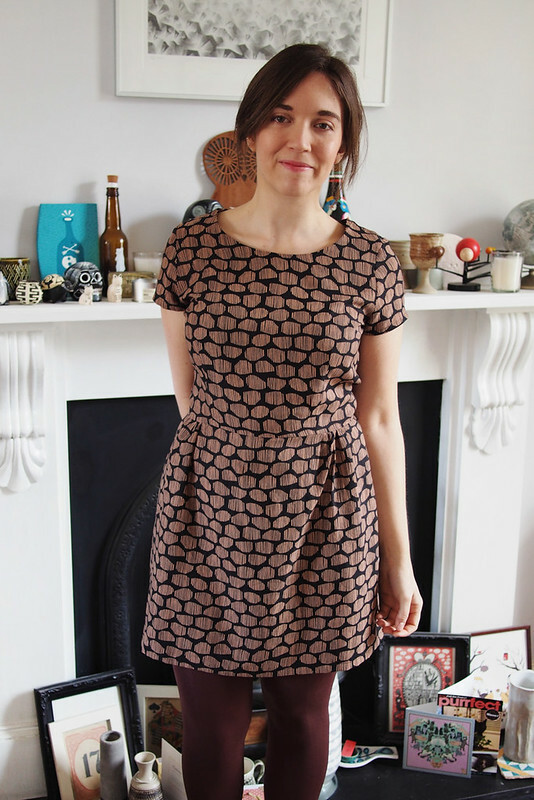 I could/should have self-drafted this rather simple style from my blocks – this frock from December is pretty similar – but fancied some instant gratification without fiddling with dot and cross paper and French curves. 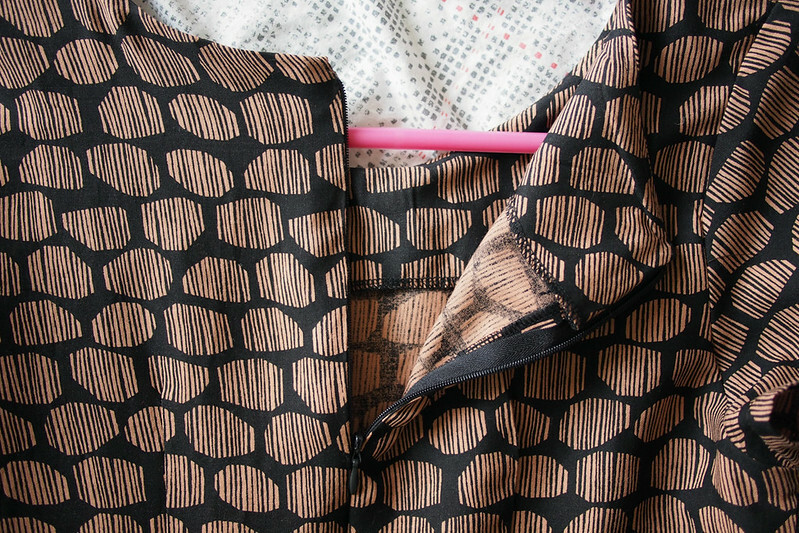 The fabric is delicious Atelier Brunette ‘Halo’ viscose bought from M is for Make a while ago. It’s a really nice slightly heavier weight fabric that’s just perfect for dressmaking, and is in my current favourite colours to wear. I cut it all on the cross-grain – the little pebble shapes actually run vertically but I preferred them horizontal. I made the size small exactly as patterned and I’m pretty pleased with the fit. I did view 2 with the cute side gathers on the skirt and the sleeves shortened a couple of inches. It’s a bit blousier on the bodice than intended due to my drapey fabric choice, but I like that effect. It’s just a bit loose through the shoulders and upper back, but at least that makes it comfortable to move in. Be warned that the skirt is pretty short – I’m shortish and like short skirts and needed to do a baby hem to keep it decent. It’s got two elements I’ve tended to avoid for a while – a neck facing and a centre-back invisible zip. I’m slowly warming to both of these things: a facing is admittedly less likely to pucker than a bias finish, and since I’ve actually learned and practiced how to do invisible zips I like them much more than I used to. Always be learnin’. 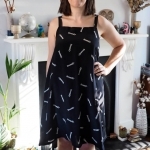 I’m really happy with this dress -it was a fun Sunday afternoon sew and the result is a perfect work or dinner-out kind of frock, the kind of which will get a lot of use. To be honest, if I were to make this style again I probably would be less lazy and use my blocks to knock-off the shape in order to address the minor fit issues around the shoulders. Oh well, it was worth buying anyway to fire up my dressmaking desires again and it’s a sweet little one to have in the pile. Absolutely beautiful Katie! I love that fabric, the colours really suit you. Nothing like a bit of easy Sunday sewing. Gorgeous dress, I really love the side gathers in the skirt. I was thinking of making some hudsons from that fabric, but am worried it will crease too much. So can I ask, have you found it a particularly crease-y viscose or one of the better ones? Hi Polly, it creased a bit sitting folded in my stash but they melted out with a quick iron and I didn’t notice any wrinkles when taking these photos (I haven’t worn it for a full day yet though). I think it’s towards the better end of the spectrum, and the slight extra weight means it should make good pants. it’s really lovely katie – very you! You alway used such great print fabrics. Oh well that the Sigma pattern turned out to be achievable without the cost… it’s ok to splurge/treat now and again. 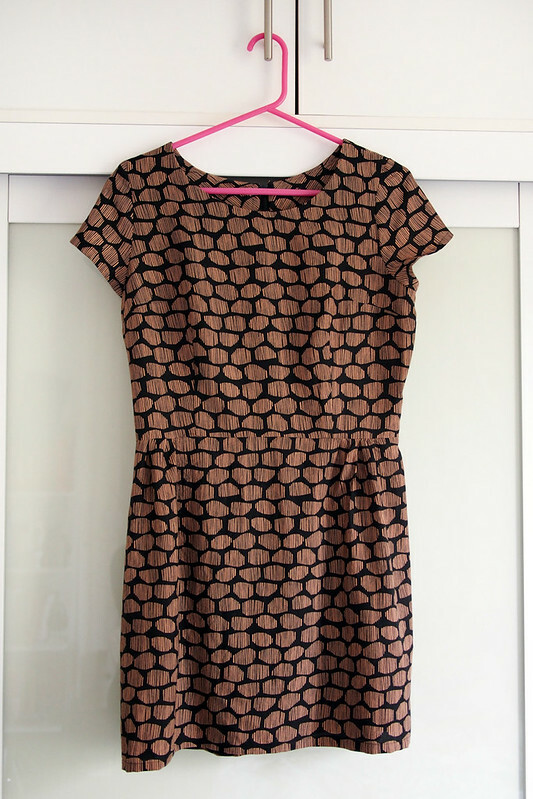 Such a cute basic dress! Ya know, I tend to prefer regular facings to bias facings. So much less fiddly to work with! I think it’s more the actual wearing and post-wash ironing of facings that I don’t care so much for, they are definitely easier to sew! But I’ve found that tacking them down strategically reduces those pain points anyway. Facings all way! Some of the time! This looks fantastic…After seeing your post I can’t wait to buy this pattern! this pattern has been on my wish list forever, haha! I think the fabric you used makes it look different than the version on their website. Yours seems more wearable, lovely print as well and the skirt isn’t too short ;) great job with the invisible zipper, mine always looks invisible until I put it one hehe! I’m sure you’ll enjoy wearing this dress, maybe you can draft a more complicated version from your blocks! Thank you! Yes the model photo looks like quite a stiff brocade even though lightweight fabrics are recommended. I think it’d work nicely in either actually. Ooh this is pretty – and the fabric is gorgeous! 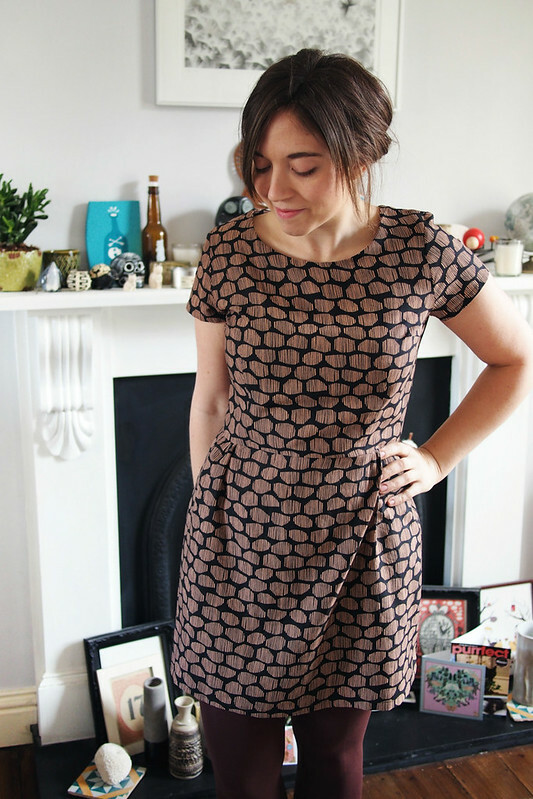 Papercut’s patterns do tend to be very short – the La Sylphide dress would have barely covered my bottom! Ha! In some ways I prefer it to always having to chop a ton of length off most big 4 patterns (such a waste of fabric) but it has to be decent! A lovely shape and perfect colours on you. I really like the colours of this dress and the side skirt gathers are a great little detail. I have this pattern too, but I haven’t made it up yet. Thank you! It’s a real quick win of a pattern. It’s very sweet – the style and colours suit you fabulously. I’m definitely more of a facing fan than I used to be, and I’ve started taking advantage of them to do sort of a wider top stitching at the neckline sometimes as a feature. It’s funny how so many modern patterns give people neck gaping issues – that vintage one I made recently had a couple of little shoulder darts which gives it such a lovely fit around the back neck – I almost always have a bit of gaposis with modern patterns. Unfortunately I never really think to check ahead before finishing…. Something to add to my never ending list of things to think about. I’ve found that true re vintage as well. I wonder if the drafting block has become broader-shouldered over the years to reflect general body shape trends, but vintage still fits us slender-shouldered types better?! I do always make pre-emptive alterations to big 4s; it’d probably be a good idea to compare any new pattern to my block and see how the upper bodice area compares. Love both the design of this dress and the fabric you’ve chosen. Great job! The dress is lovely. I really like the pattern, I’ve been looking for something similar, but I dont think Im ready to tackle sleeves yet!! I really like this dress. I think the waist with the darts really suits you. Definitely a winner! Ooh, I love this! The style and the fabric are perfect together!!! Lovely fabric and style combination – which both really suit you!